I can't believe it's already the end of October! This year has flown by so fast! If you're like me and have been super busy these past couple of weeks, you haven't had anytime to think about a Halloween costume. I have a super easy and cute costume that is quick to make at the last minute. This past week was a spirit week at school and we had Disney day. 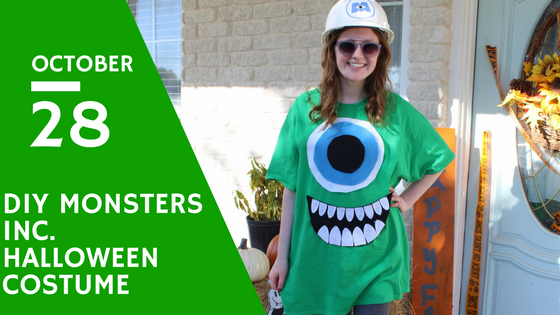 It crept up on me and I found myself without a costume the night before so I quickly ran to the craft store and picked up a few supplies to whip up this easy Mike Wazowski costume. For the eye ball I used some of my mom's cooking bowls and a paper plate to get the different sizes. I used chalk to sketch out everything on the felt just in case I messed up. I took paper and drew out two different size stencils for teeth so that they would all look the same. Once I finished cutting out all the parts I layed it out on the shirt to figure out where I wanted everything to go and marked it with chalk. Then I glue everything together! And that's it! I wore my Jadelynn Brooke bow leggings and polka dot Nikes with the shirt. It made for a really comfortable costume yet it was so cute! You can purchase these leggings using my code SLMHS for 15% off at JadelynnBrooke.com. For the hat I wore a hard hat that we had at my house and I printed off the Monsters Inc. logo and taped it on the front. If you're looking to wear a hard hat but don't have one I came across the thin plastic ones for a couple of dollars at the craft store. You could also use a basball hat and tape the Monsters University logo on it. Your DIY Monsters Inc Costume looks fabulous! I love the shade of green of the t-shirt-dress and the way it looks styled with the Jadelynn Brooke bow leggings and polka-dot Nikes. That huge eye and big teeth you added look great!